I can’t believe Thanksgiving is Thursday. THIS Thursday! If you’re looking for that one side dish to round out your Thanksgiving feast, I would heartily nominate Brussels Sprouts Au Gratin. 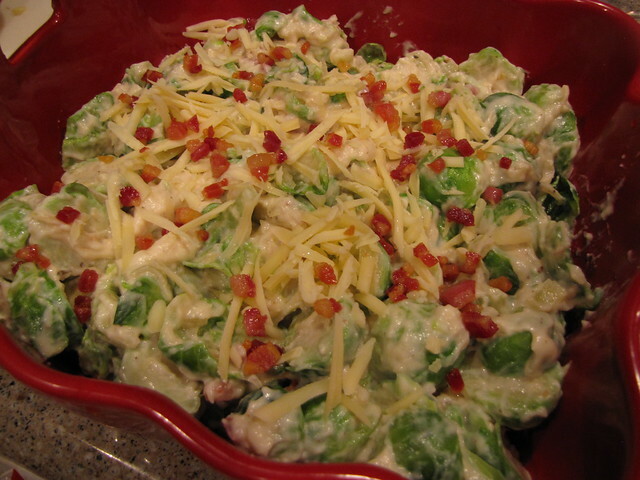 Rich, creamy, decadent….and a green vegetable! I’m pretty conservative when it comes to my Thanksgiving menu. I like the things that I’ve always had – Turkey cooked the way my dad always makes it (which is practically idiot-proof), mashed potatoes, gravy, world’s best Sweet Potato Casserole, and some kind of green beans. Last year I added Braised Brussels Sprouts to the menu and they proved to be so popular at Thanksgiving that I repeated them at Christmas. This year we’re taking those sprouts to a whole new level…a cheesy Au Gratin level! Time to get on board with Brussels Sprouts. 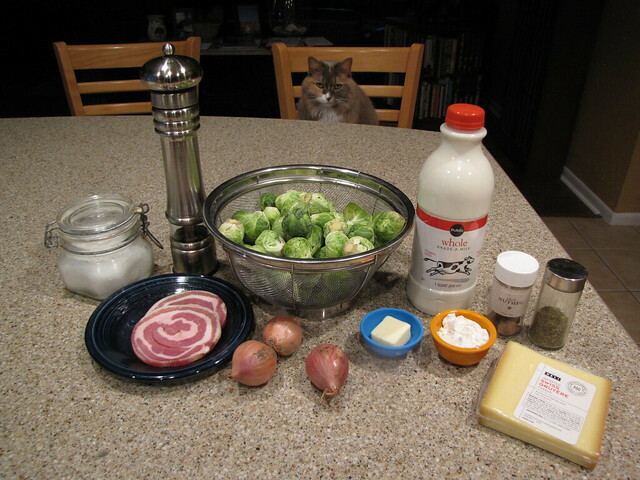 Brussels Sprouts, Pancetta, Shallots, Butter, Flour (GF is fine), Whole Milk, Gruyere Cheese, Nutmeg, Dried Thyme, Salt & Pepper. Poor Lulu. I’ve been gone so much lately that she follows me around the house on the days that I am home. I’m sure she was hoping for this dish to have chicken in it. Rinse 2 pounds of Brussels Sprouts under cool water. Cut off the bottom of the stem and discard any tough, ugly looking outer leaves leaving a nice tight sprout. 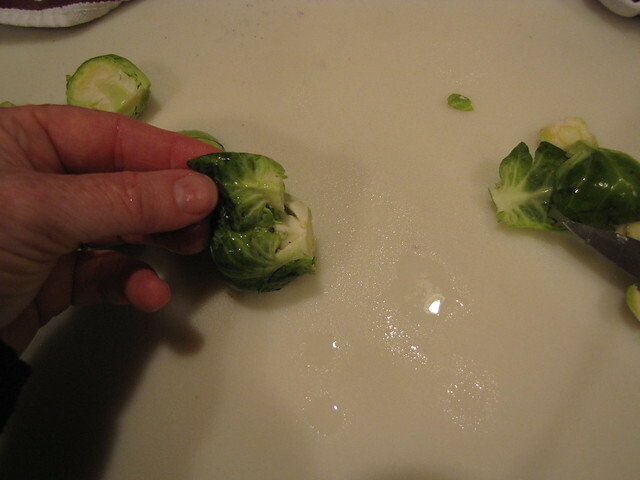 Cut the sprouts in half and set aside. Bring a large pot of salted water to a boil. 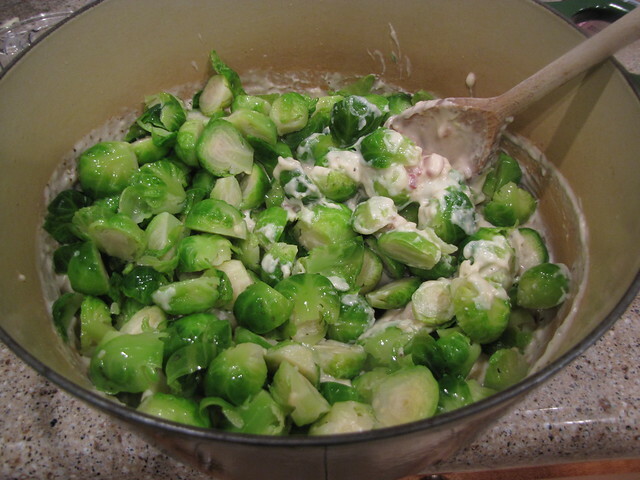 Add the sprouts and cook or blanch them quickly, only about 3 minutes. This gets the sprouts started cooking so they just start to get tender. Don’t cook more than 3 minutes. There is nothing worse than over cooked Brussels Sprouts. I’m convinced that overcooking is the main reason so many people dislike them. 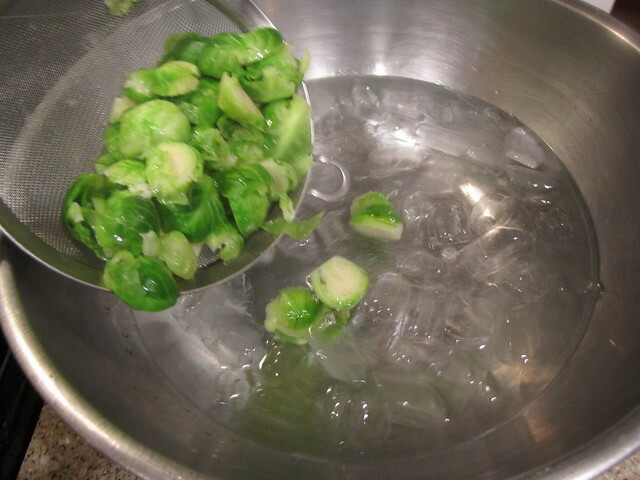 After 3 minutes, rescue the vibrant green sprouts and plunge them immediately into an ice water bath. This stops the cooking and preserves the green color. Finely dice 4 ounces of Pancetta. I buy my pancetta at the deli counter. Ask for 2 slices that are about ¼ inch thick and that should give you about 4 ounces. Obviously if you want this to be vegetarian, you can omit the pancetta. 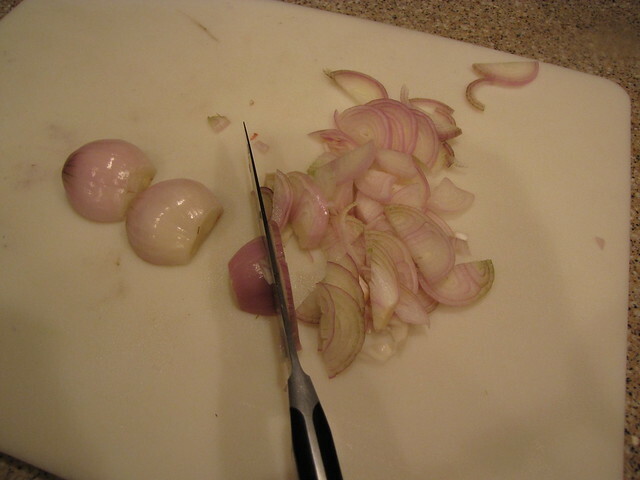 Peel 3 shallots, cut them in half, and thinly slice them. Whew! These babies were strong. I did some serious crying over these shallots. Place the pancetta in a large pot (I used the same one I used to cook the sprouts) over medium low heat. Cook the pancetta slowly so that it releases or renders the fat from the meat. This might take up to 10-12 minutes. Don’t crank up the heat or the pancetta will brown into hard bits before you get any of the good drippings of fat off of it. 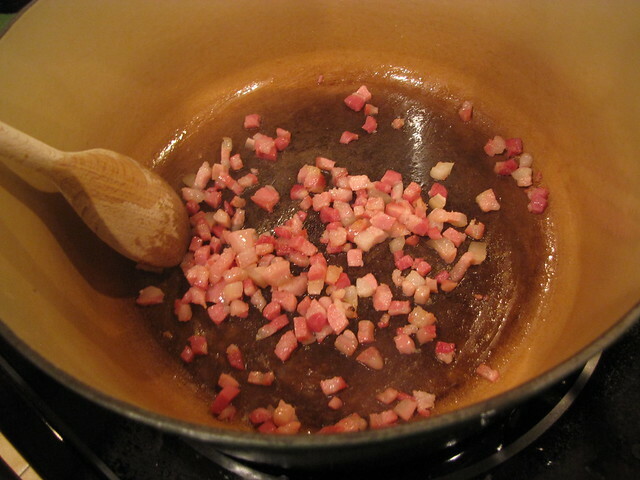 Use a slotted spoon to remove the browned pancetta from the pan reserving any rendered fat. 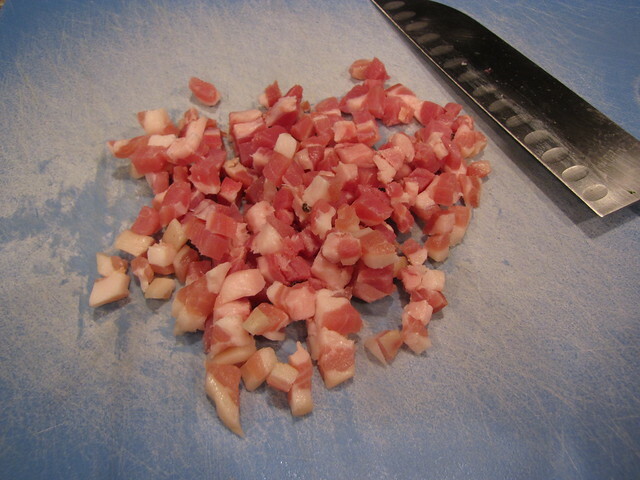 Set the cooked pancetta aside and avoid snacking on it if you can. 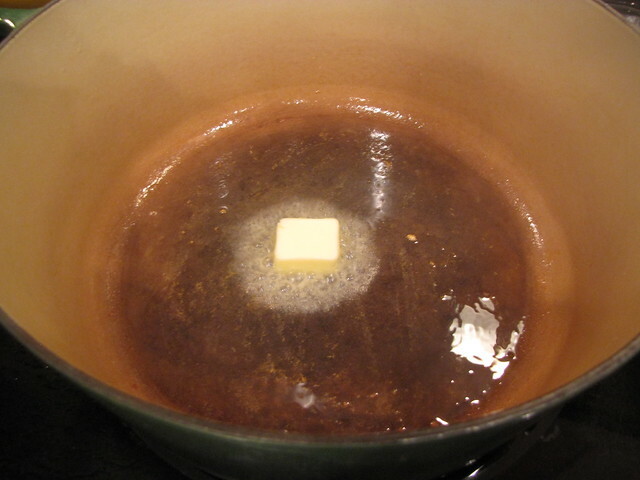 Add 1 Tablespoon of butter to the fat from the pancetta in the pan. 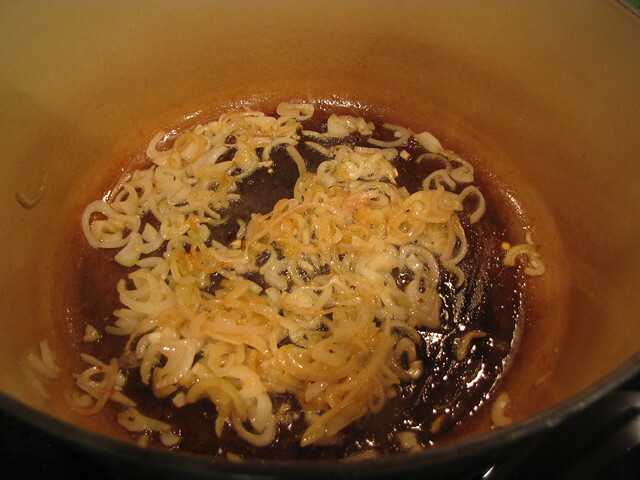 Add the sliced shallots and cook, still over medium low heat until they are softened and golden brown, about 5 minutes. 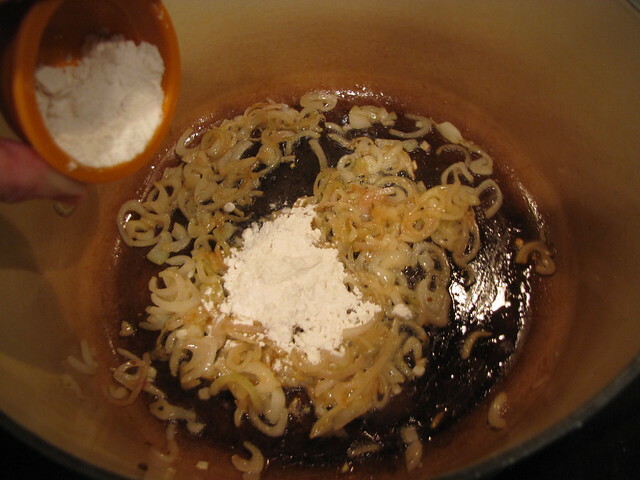 Add 2 Tablespoons of flour (Gluten Free flour works fine) and stir it into the shallots to make a roux or thick paste. 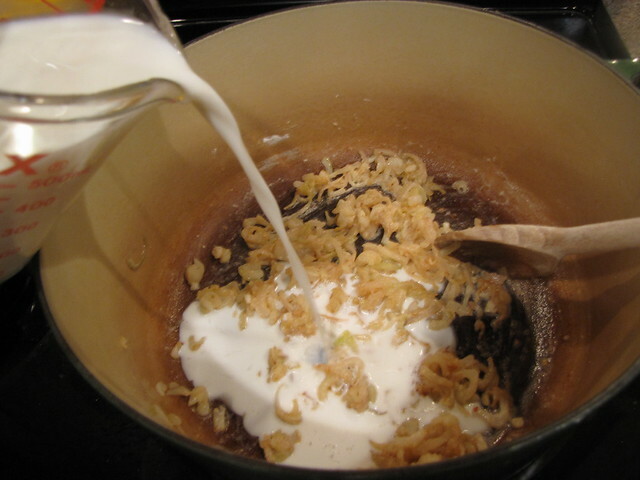 Slowly add 1¾ cups whole milk. I like to add my milk in thirds rather than dumping it all in at once. 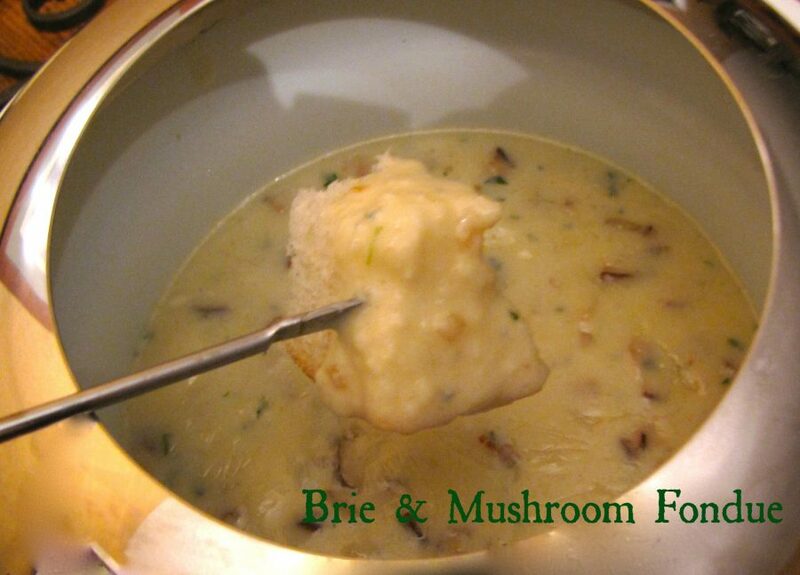 That lets you do a little more stirring to easily get a velvety smooth sauce. 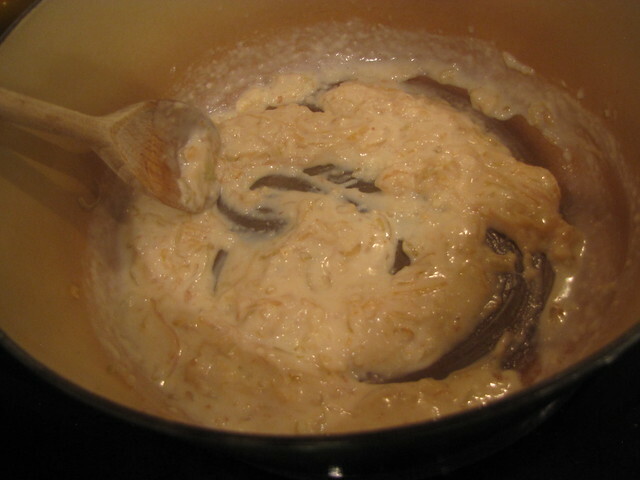 continuing to add milk until your sauce is thick and luxurious. 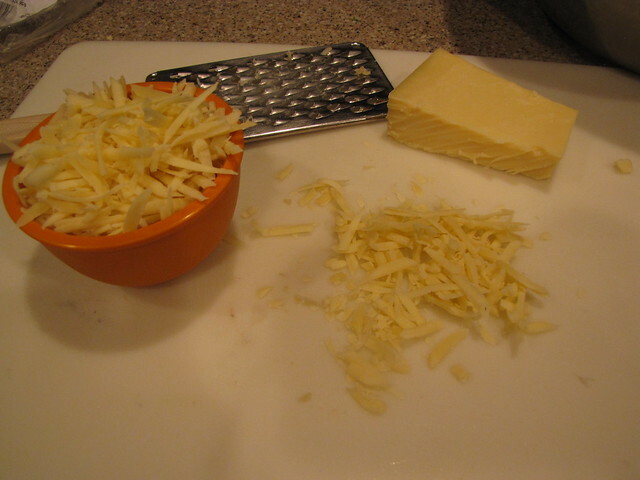 Grate 4 ounces or 1 cup of good, tangy Gruyére cheese. 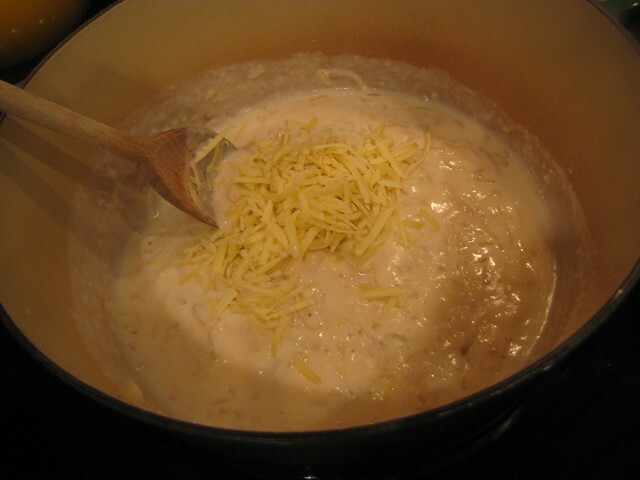 Add about 2/3 of the cheese to the sauce and stir it until it melts. Reserve the extra cheese for the topping. Add HALF of the cooked pancetta back into the sauce and reserve half of it for the topping as well. 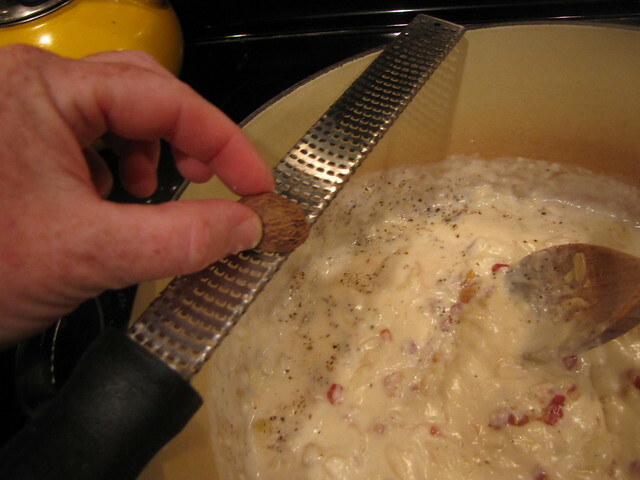 Add a pinch of nutmeg (grate it fresh for the best flavor) and add a pinch (no more than 1/4 teaspoon) of dried thyme. If you have fresh thyme, that would be even better…use up to 1 teaspoon of fresh. Season to taste with salt & pepper. For me that was about 1 teaspoon each. 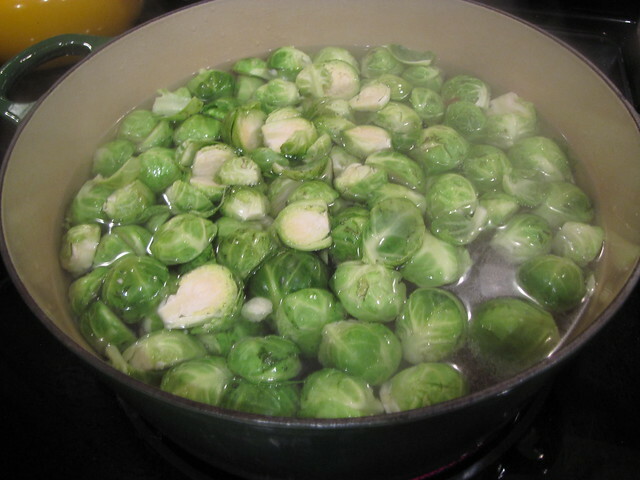 Drain the cooled brussels sprouts well and add them to the sauce. 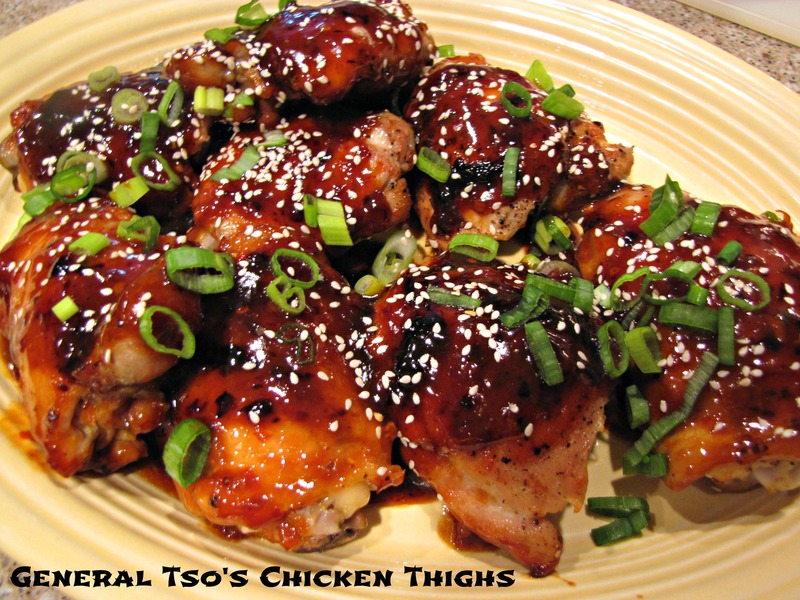 Gently fold them into the sauce until well combined. Take a little care here so that you don’t knock the sprouts apart. 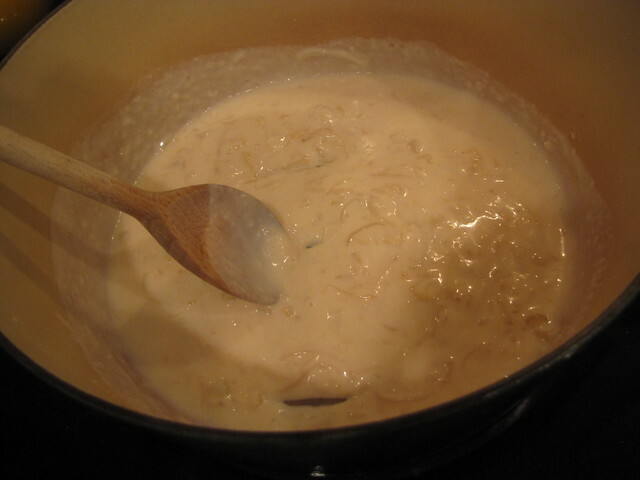 Grease or spray a medium sized casserole dish (mine is about 10 inches square) and dump in your cheesy sprouts. Top with the reserved cheese and pancetta bits. Bake at 400 degrees for 25-30 minutes until golden brown. MAKE AHEAD PLANS: You can make the sprouts ahead and hold them in the fridge uncooked OR you can cook them for about 20-25 minutes, remove them from the oven and then rewarm them under the broiler on a rack in the middle of the oven at the last minute to get that golden crust. 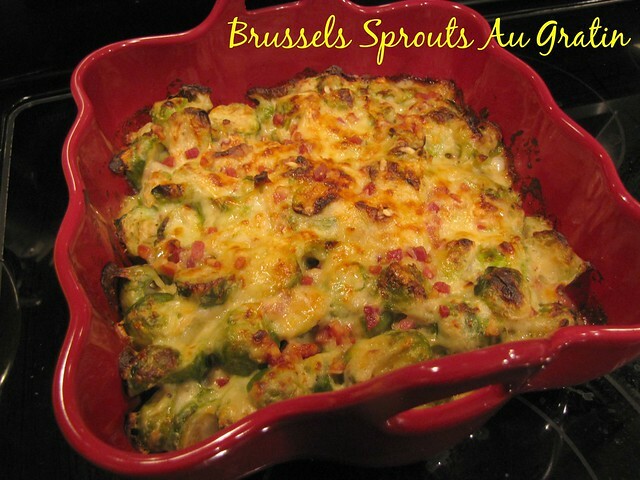 I’m a big fan of Brussels Sprouts and an even bigger fan of cheese so trying this recipe was a no brainer for me. I think you could easily convert non-sprout loving people with this dish but you might want to keep this a secret so there is more for you! Need MORE Thanksgiving Recipes? Click HERE to go to the Thanksgiving Archives OR HERE to go to the Idiot’s Kitchen Thanksgiving Pinterest Page. Love this. 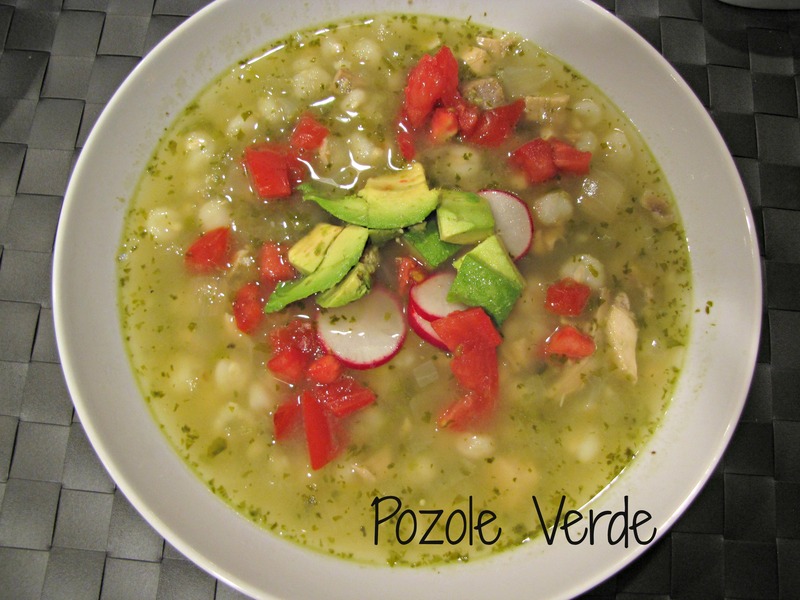 I was adding it to our menu and my MIL volunteered to make it. 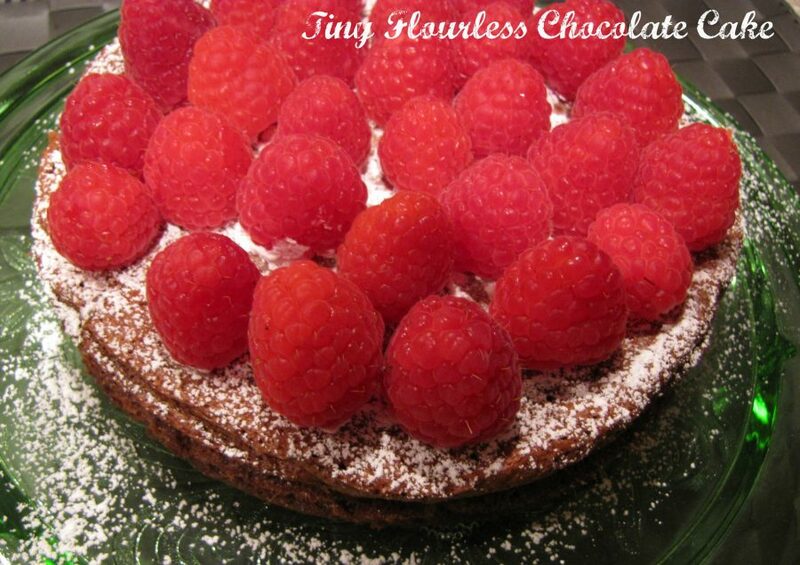 She did it last week just to make sure it was good enough…..and she said it was!!! 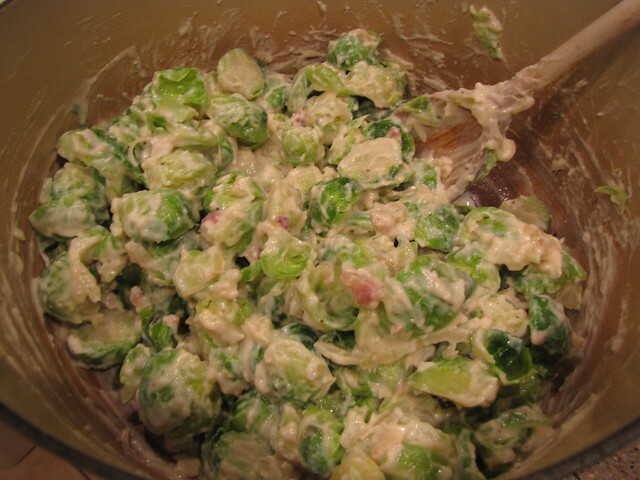 I love the sprouts already just roasted….so this will be a real treat! I doubled the amount of pancetta because 2 oz. is hardly any. Otherwise I pretty much stuck with the recipe. So good! Happy Thanksgiving!! !